Steven Gerrard’s summer shake up has begun with three early player movement confirmations. Out go Russell Martin back to Norwich (despite Allen's claims otherwise) and David Bates off to Hamburg, while new signing Scott Arfield has put pen to paper on a four year deal at Ibrox, announced earlier today. With the disastrous Martin now gone and Bates following him, it leaves Rangers with formally two senior defenders in Bruno Alves and Fabio Cardoso. Whether Gerrard would see either Alves or Cardoso as part of his plans is unclear, but talk is that Alves, contracted till summer 2019, may actually get something of a reprieve under the Liverpool legend given his excellent display at Easter Road yesterday. Without any question he’s the best defender in the SPL, but just hasn’t shown it enough – equally Rangers were unable to find the right partner for him with none of the pairings at the back working especially well this season. As for Cardoso, well, it’s astonishing what different managers can get from different players so maybe Gerrard can eke a half decent stopper from the ex Setubal man. 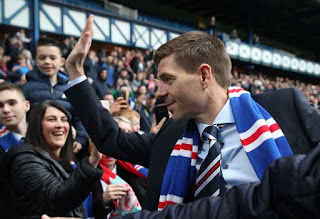 Either way, there is no doubt Rangers will have to make serious inroads to the transfer market to bring in two or three very decent defenders. Meanwhile winger Arfield becomes Rangers’ first formal summer signing, with the Canada cap unveiled this afternoon. Mark Allen confirmed this signature was given Steven Gerrard's green light, and hopefully the attacking midfielder is the step up in quality Rangers desperately need. Great start by Gerard. Please keep Alvies good back up for two new centre halves that we need. I agree, I would keep Alves. He was outstanding yezterday. We would get no transfer fee for him. On the down side, he is on ridiculous wages: something Gerrard might just have to accept. But we definitely need an additional two centre backs. Not Cardossa however! Alves is finished,spends to much time on the treatment table,we will never get a settled defense with him in and out the team I also question his commitment to the team especially over the winter months and also his huge wage gives us no value for money. I would take it that murphey may not have done enough to get a permanent deal. Def wouldn’t pay the 1million for him as quoted when he signed. I would start by getting them back to training in two weeks and get them playing as one unit together in time for European football we don't need another embarrassing exit and maybe by the time our season starts we might be in a postion to challenge both celtic and Aberdeen for the greater good of scotish football . Can’t see Alves returning to Rangers after the World Cup. Yes he should have played more this season as he is streets ahead of Bates and Martin - but he is now injury prone and your not going to get a season out of him. Also with the World Cup he will not be back in training with the squad for the European qualifiers and again would be absent at the start of the season. Going be a great watch next season,and it is ours lets do this SG. do you ever watch Rangers play, Alves the beat defender in the league 😂 Tav has been a better defender than h & Tav canny defend. Long time Burnley supporter here. You have got yourselves a terrific player in Scotty Arfield, a mainstay of the Burnley side that won 2 promotions to the Premier League and who was instrumental in the 23 game unbeaten run that took us to the Championship title in 2016. Technically sound and versatile - he can play in any of the midfield or forward positions - always gives 100% for the team and the club shirt he wears, and loves the fans as they love him. If you haven’t seen this winning goal against Blackburn Rovers at Ewood Park in October 2015 (Burnley v Rovers is the East Lancs version of Celtic v Rangers), take a look. It epitomizes Arfield – after he banged in that goal he immediately ran the length of the pitch to celebrate with the Burnley fans and took the entire team with him.